Michael and I were lucky enough to be among the first people to preview Royal Caribbean's recently renovated Navigator of the Seas, which sailed from Galveston this Summer! 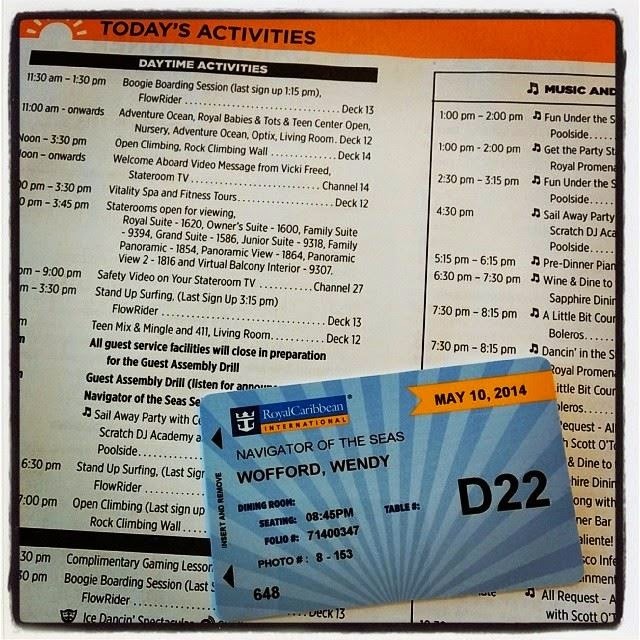 Royal Caribbean kindly included in an invitation-only overnight preview sailing to check out all the ship has to offer! 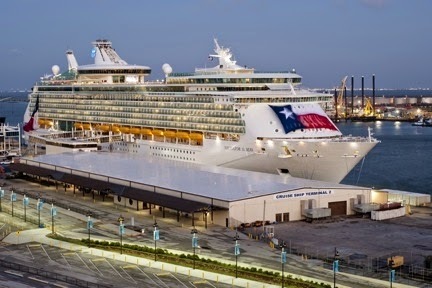 Navigator of the Seas calls Galveston its Summer home port. 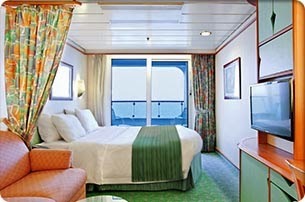 That makes this fabulous ship an ideal vacation option for families, as well as couples looking for a romantic getaway. 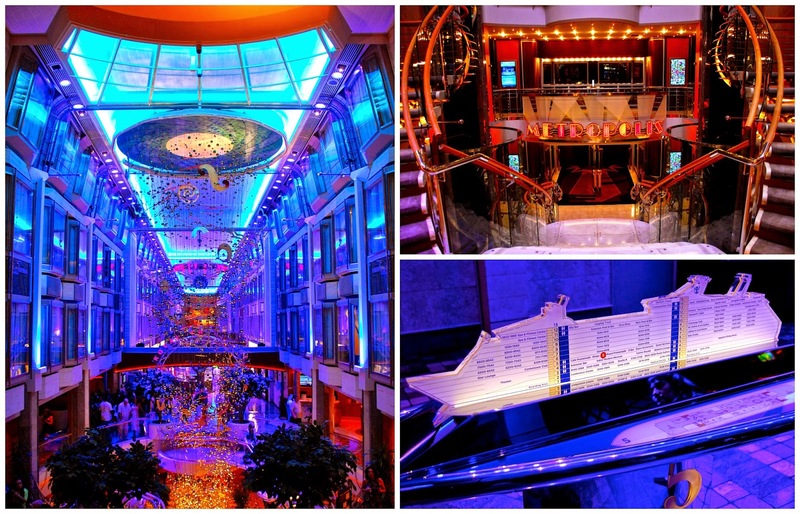 Once you board the ship, you'll find every amenity that you need for a good time: pools and a variety of outdoor activities, a skating rink, entertaining shows, a wide variety of restaurants, and a full-service spa. We boarded the ship early on a Saturday morning at the convenient Port of Galveston. Parking was easy and stress-free thanks to convenient shuttle buses that drop you right at the point of embarkation. The pre-boarding process was very simple, and it took less than an hour. Much like the process at an airport when we fly, we had to go through a security checkpoint. We then checked in with the friendly staff, where we each received a handy card that served as both our room keys and our identification cards. Just like that, we were on our way to Room D22! 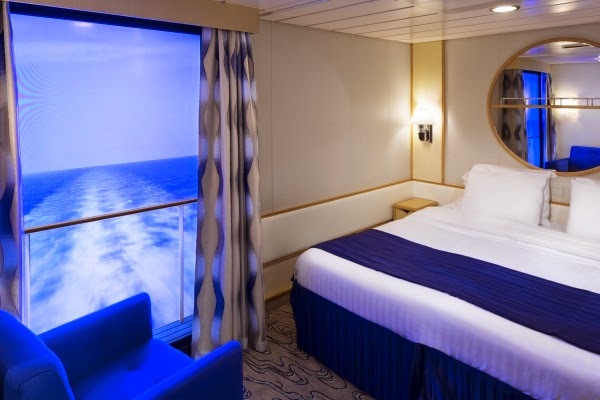 When we arrived at our room, we were excited to see that we were staying in an Oceanview Stateroom with a small balcony, as well as a large bed and sitting area. It was just the perfect size -- and much larger than we expected. Waiting for us was a handy brochure that laid out all of the ship's onboard activities for our cruise. We took a few minutes to look over the activities and admire the lovely water view from our balcony. I have to mention one very cool addition to Navigator of the Seas during its recent renovation. They now offer select interior rooms with Virtual Balconies. Virtual Balconies are an 80-inch high-definition screen that spans nearly floor to ceiling. For the first time ever, guests can enjoy real-time views and sounds of the ocean and destinations from the comfort of an interior stateroom. We were able to check out one of these rooms during our visit, and the technology was really impressive! After we settled in, we set out to explore the Navigator of the Seas. On the way to the pool area on the 11th deck, we stopped to admire the gorgeous Promenade that's in the center of the ship. 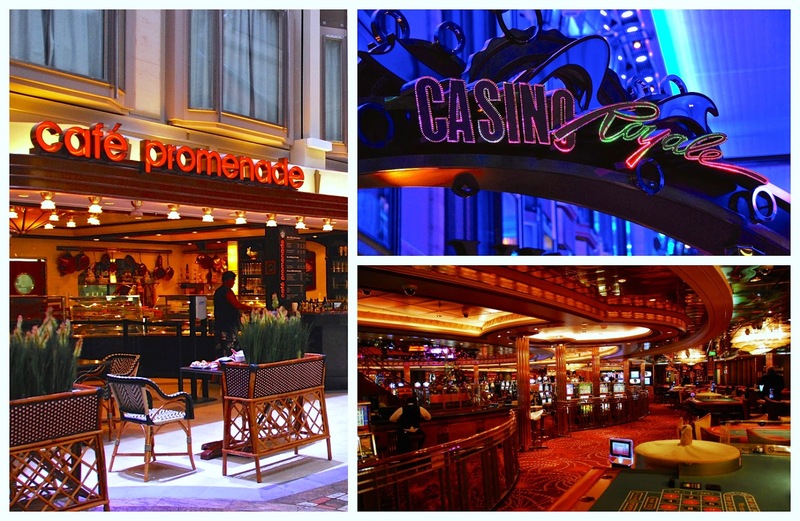 The Promenade has shops and restaurants, as well as a casino and performance venue. Navigator of the Seas is huge! It has 15 decks and TEN pools. When we got to the pool level, we grabbed a tropical drink and checked out the area. In addition to numerous pools, there are hot tubs, a gigantic outdoor movie screen, a jogging deck, and even live music. This was a great place to hang out while we waited for the ship to set sail! Just before the ship set sail, we took part in a brief required safety training. 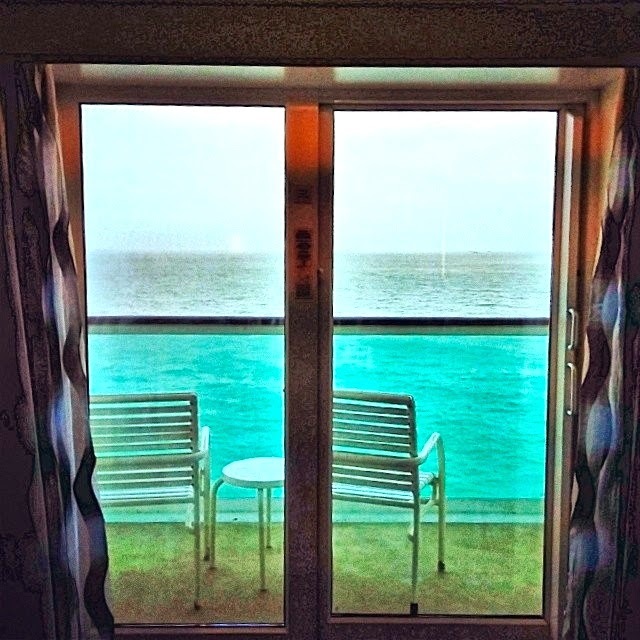 Then, it was back to our stateroom to change into dinner attire -- but not before we ducked outside to snap a picture of the Gulf of Mexico...once you're a few miles offshore, the water is a lovely shade of blue-green! Navigator of the Seas offers a wide range of dining options, most of which are included in the cost of your cruise ticket. The Main Dining Room serves multi-course menus for breakfast, lunch, and dinner. 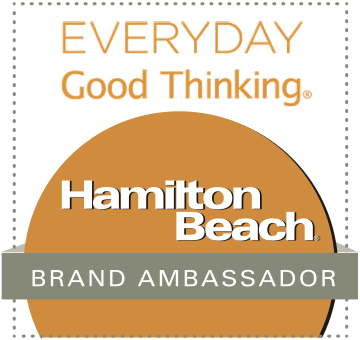 Other complimentary dining options include the Windjammer Cafe, Cafe Promenade, and room service (a small fee applies for room service ordered between midnight and 5 am). 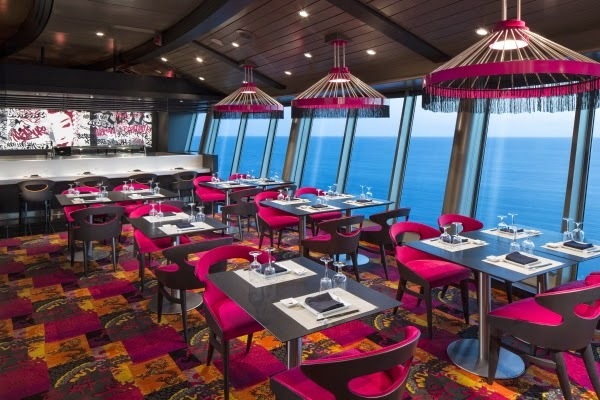 For a small additional fee, Navigator of the Seas offers several upscale dining options. Before our dinner at Izumi Japanese Cuisine, we attended a cocktail reception with members of the Royal Caribbean executive team. We enjoyed champagne and met members of the Royal Caribbean Marketing team, as well as CEO Richard Fain. Mr. Fain was very personable, and he made us feel very welcome onboard Navigator of the Seas. After the cocktail reception ended, we headed to Izumi for a multi-course Japanese feast with two members of the Royal Caribbean Marketing team and another couple who was attending the preview cruise. Michael and I don't normally eat a lot of Japanese food, but I have to say the food at Izumi made us coverts! 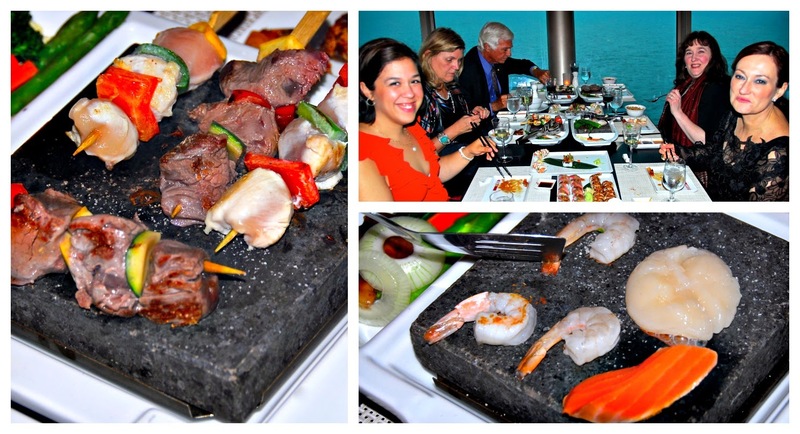 We had a great time -- lively conversation and fabulous food makes for a perfect evening at sea. 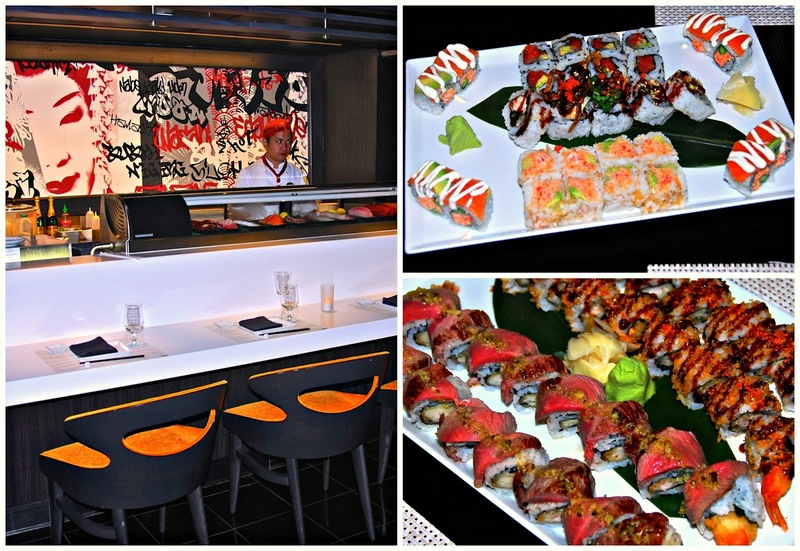 Everything that we tried from Izumi's varied menu was expertly prepared and delicious! 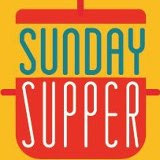 We started out with a sampling of appetizers, including: Edamame Soy Beans, Chicken Kare-Age, Shrimp Gyoza Dumplings, and Shrimp Firecracker Spring Roll. 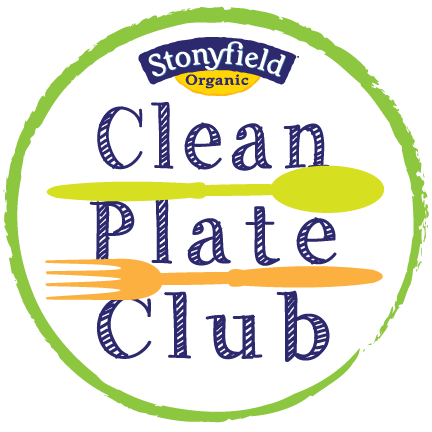 Everything was perfectly fried -- not greasy at all! My personal favorite were the Shrimp Firecracker Spring Rolls -- a whole shrimp, cream cheese, crab, and samba chile were rolled in a Spring roll wrapper and fried. Amazing! We also were treated to two large platters of freshly rolled sushi. 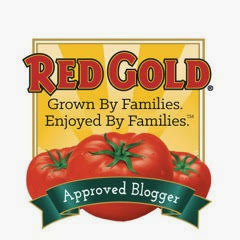 It was amazingly fresh and so very flavorful. Even Michael -- who doesn't normally eat sushi -- was impressed after trying several of the rolls. 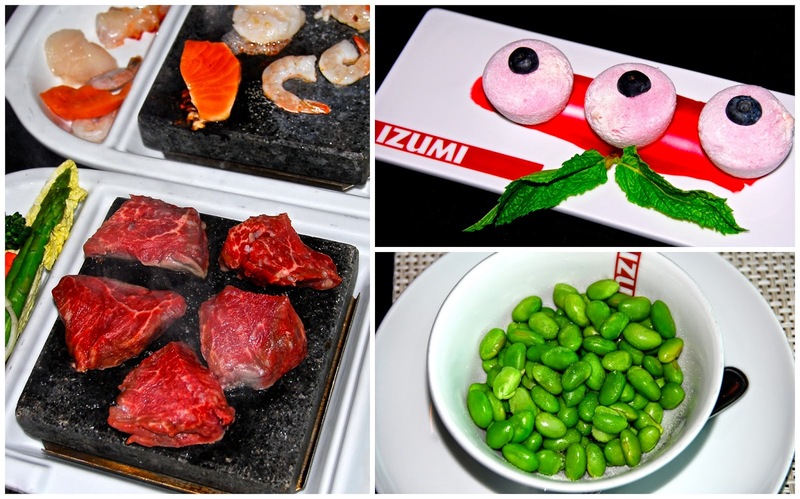 For our entrees, we decided to try the fun and interactive Hot Rock Grill! Lava rocks are heated to a super-hot 575 degrees in the kitchen. The heated squares are added to a platter of meat or seafood and vegetables. I had the Mixed Seafood Rock with shrimp, scallops, lobster, and salmon. Michael had the Chicken and Beef Skewer Rock. Both Rock Grill entrees came with veggies, dipping sauces, and fried rice. Each person cooks their seafood or meat directly on the rock at the table. It was really fun...and tasty! We ended our dinner with a dessert of Strawberry and Green Tea Ice Cream Mochi. If you've never had mochi -- it was our first time! -- it's ice cream wrapped in a chewy rice outer layer. It's refreshing and light...perfect for a Summer evening. After dinner, we headed back to our stateroom to change into casual clothes. We had a wide range of options to choose from for the rest of our evening: a show, casino gaming, or dancing at a 70s Disco Party to name a few. Instead, we fell asleep watching a Spurs playoff game...and didn't wake up again until 300 am. Oops! Normally, that would mean there was nothing to do...but not on Navigator of the Seas! The Promenade Cafe was still open, so we went there to have drinks, fresh-made croissant sandwiches, and some sweet goodies. Despite the late -- or early -- hour, the Promenade Cafe was jumping. The casino had just closed, but we went inside to have a look around. We also walked around on the outside deck, enjoying the peaceful view of moonlight on the Gulf of Mexico. We both commented that we really liked that we could safely wander around the well-lit ship -- even at 400 in the morning. After our early-morning stroll on the Promenade, we headed back to our stateroom to grab a bit more sleep. When we woke up again, it was time to grab some breakfast before we disembarked the ship. 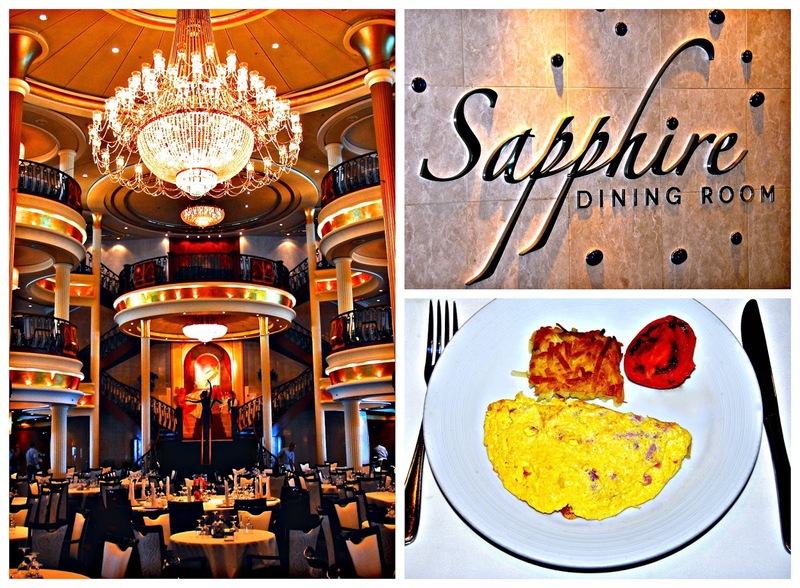 The Sapphire Dining Room is Navigator of the Sea's main dining room...and it's a beauty! It has multiple levels and can seat more than 1500 passengers. We ordered omelets, which were served with hash browns and freshly squeezed orange juice. It was very tasty...a great ending to our overnight adventure at sea! After breakfast, it was time to grab our bags and disembark the ship. The process was simple and took no time at all. The most time-consuming part was waiting in the line to catch a shuttle back to the satellite parking lots. We made it back to our car in less than an hour and headed for home. Although our preview cruise was quick, it made a big impression on us! 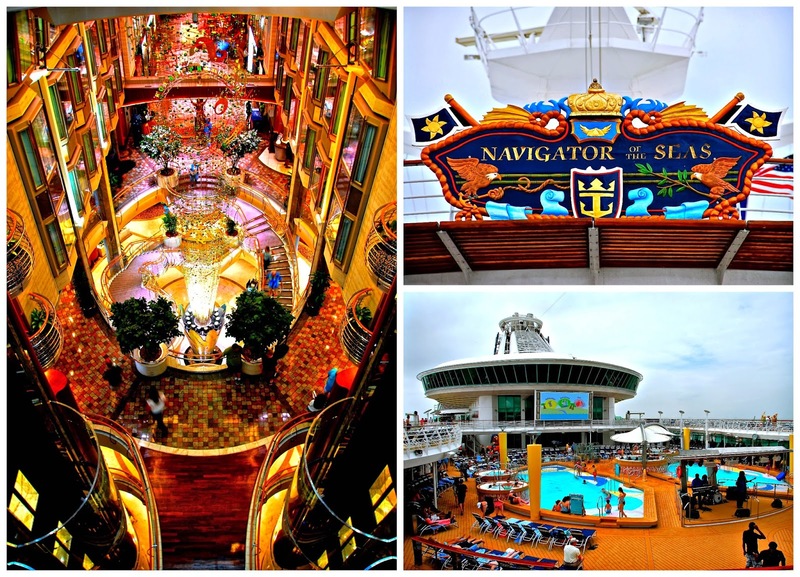 Royal Caribbean is a first-class operation, and Navigator of the Seas is a beautiful ship. We would definitely go on a longer Royal Caribbean cruise without hesitation. Disclosure: Royal Caribbean provided us with a complimentary overnight preview cruise on Navigator of the Seas to facilitate this post. All opinions expressed are my own. Unless otherwise noted, all photographs are copyrighted by Michael K. Garcia and may not be copied or otherwise used.